The tools are merely a means to an end. What you do with the tools, and how you integrate them to improve the base business are what really matters. "Trust" and "Influence" are relative and fluid. However, they generally belong to people that consistently deliver positive, remarkable experiences -- across channels and over time. Deliver on every promise, exhibit high level of ownership / stewardship and be a "mensch." Do this, and being an influential trust agent will come naturally. Senior engagement is critical. If your senior leadership wants to relegate social media to an intern, agency or middle manager, resisting the notion that these tools may transform the enterprise, consider changing jobs. The tools require a high level of proactive readiness. Engage in these channels and you're a friend, confidant, real-time service agent, facilitator, guide and publisher. Be prepared in advance. Get the right hooks in place and the right teams involved. Establish policies and processes that expedite resolution and response. 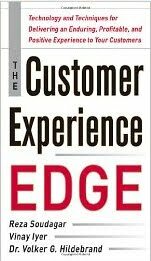 Success is (still) about the Customer Experience. If holistically, your base-level customer experience stinks, using social media tools probably won't help much. That's why this blog is dedicated to CX rather than preaching the virtues of any one specific channel. Good help is golden. Strategists who can't execute are as dangerous as "one-trick ponies who only know how to use a single tool ... or generalists who speak at conferences a lot but don't actually deliver any work! Find resources that can develop a solid strategic plan, execute, help your organization prepare, educate and stand by to help, if needed. Look for dirt under the fingernails... and don't be social media sharkbait! Add your truths! I'm all ears! Spring is almost here and with it comes the birth of many new things, including the new The Age of Conversation 3, which is scheduled to be released in April. I am honored to have been selected as a contributing author with an esteemed group of incredible thinkers, writers and thought leaders. All of them are active in a variety of areas, working across industries on the "bleeding edge" of social media. This will be a great book for anyone looking to practically implement social tools into next-generation customer management. Here's a list of contributing authors and links to each! I'm excited to read all the fabulous insightsin this book... carrying forward the tradition from two greatly successful editions. Stay tuned for more!